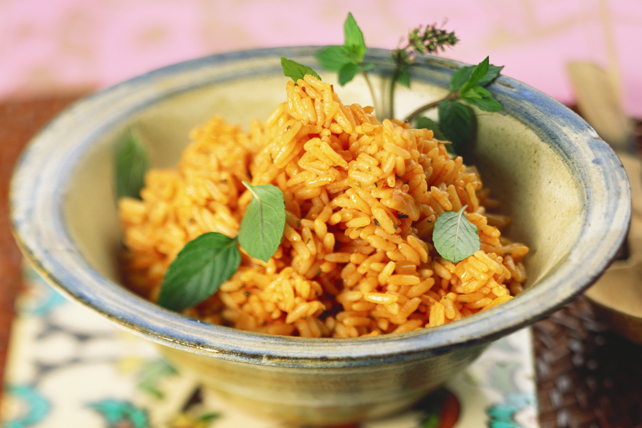 This simple Tomato-Rice Pilaf is the perfect side to serve with cooked chicken or pork. Melt butter in large saucepan on medium heat. Add onions; stir. Cook 5 min., stirring frequently. Add garlic, Worcestershire and rice; stir. Cook 3 min., stirring frequently. Stir in tomato juice and water; bring to boil. Cover; simmer on medium-low heat 20 min. or until rice is tender and liquid is completely absorbed. Remove from heat. Let stand 5 min. Fluff with fork before serving. Top with mint. Stir 1 cup cooked peas, toasted slivered almonds or chopped dried apricots into cooked rice mixture before the 5-min. stand time.